SATRA can test the thermal resistance or thermal conductivity of construction materials and products. The implementation of the Construction Products Directive (CPD) in Europe has resulted in a surge of interest in the performance of many aspects of materials and products used in the construction industry, with a specific focus on a number of key areas including reaction to fire and thermal insulation properties. As a Notified Body for the CPD, SATRA is able to help manufacturers with various aspects of testing and certification of products and factory production control. SATRA has also recently invested heavily in additional testing capacity in this area. Here we will look at one of these investments – a new thermal guarded hotplate. This unit has been commissioned to measure the thermal insulation of floorings and insulation products for the construction industry. In order to be sold within the EU, construction products generally must meet the essential safety requirements in the CPD (see the article 'Ensuring compliance with the CPD'). This usually involves undergoing specific tests and examinations, several of which must be conducted by a Notified Body. Thermal insulation products and floorings, which are claimed to be fire retardant, have to be assessed by a Notified Body. The Notified Body is responsible for a number of activities including initial type testing, factory production control audits and audit testing of samples on an ongoing basis. SATRA’s guarded hotplate apparatus measures the thermal resistance (m2.K/W) or thermal conductivity (W/m.K) of a material. The performance of thermal insulation materials is becoming increasingly more important in an attempt to make commercial buildings and homes more efficient in preventing heat loss. Flooring materials need to be as efficient as possible in preventing heat loss through the floor. However, it is also essential to know the thermal characteristics of floorings when used in conjunction with underfloor heating systems so that designers can ‘fine tune’ the heat output in order to maintain a comfortable room temperature. The SATRA guarded hotplate has been designed to meet the requirements of EN 12667:2001 ‘Thermal performance of building materials and products – Determination of thermal resistance by means of guarded hotplate and heat flow meter methods – Products of high and medium thermal resistance’. It consists of a two specimen guarded hotplate – in other words it has a heated plate which is sandwiched between two cooling plates. In use, a test specimen is placed between the hotplate and each of the cold plates. The overall test specimen and plate area is 500mm x 500mm with a central metering (measuring) area of 250mm x 250mm. 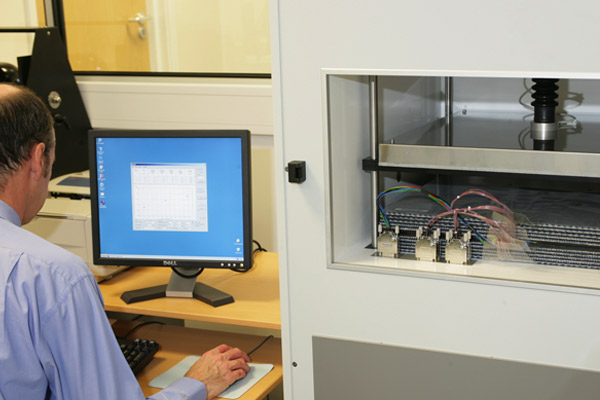 The equipment is capable of handling specimens of between 20mm and 110mm in thickness. In order to carry out a test, SATRA requires two identical square test specimens with an area of 500mm x 500mm and at least 20mm thick. In the case of very thin materials, it is possible to ply up layers to a thickness of at least 20mm per specimen. The equipment is capable of measuring materials with thermal conductivities between 0.01 and 0.5W/m.K. Please email floorcoverings@satra.com for general enquiries on floorings and construction products for testing, type-examination or production control.